Metastasis of cancer is a complex process that involves myriad biochemical and biomechanical factors, and a central episode is the transendothelial migration (TEM) of tumor cells: tumor cells detach from primary tumors and pass into the blood vessels where they can be transported over long distances. These mechanisms are similar to the ones used by leukocytes involved in the immune system. Understanding TEM is not only a major scientific challenge, but also holds great promise for new cancer therapies. For this reason, TEM has received intensive research attention in recent decades, and considerable knowledge has been gathered on the biological and mechanical factors that participate in this process. However, we do not yet have a coherent understanding of the whole picture. 2. developing a biophysical model that quantitatively describes the process of transmigration. 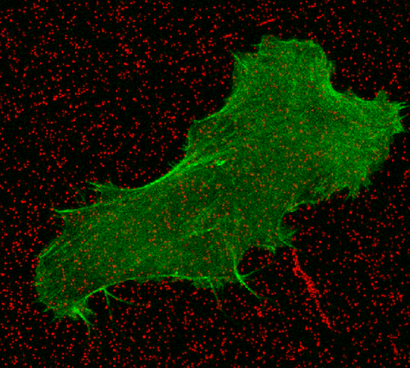 Thanks to a very original method developed at the LIPhy in Grenoble using atomic force microscopy as a way of measuring traction forces (referred to as Traction Forces Microscopy - TFM), the stress effects generated by tumor cells as they undergo transmigration through the endothelium can be quantitatively studied at the scale of both the tumor cell and the endothelial cell monolayer. This method that proved efficient with leukocytes has never been used with cancer cells before. As the major outcome of the study, we expect a phase diagram in terms of the biomechanical parameters of the tumor and endothelial cells that delineate the conditions under which transmigration will succeed or fail. This project involves a collaboration between the University of British Colmumbia and the LIPhy.